It’s the most wonderful time of the year for many-a-reason, not least because it’s the month in which it’s totally legitimate to eat chocolate at any time of day, to wear sequins and festive knitwear 90% of the time - and of course - drink. Thankfully, lots of people like booze and being the helpful little elves we are, we’ve compiled this list of nice but inexpensive drinky treats. They’re so good you might want to tell people you were their secret santa. But don’t - just be inwardly smug and try not to look too disappointed when you unwrap novelty socks and a set of scented soaps. 1) They come in pretty packaging so there’s no reason to wrap them. Plus we can all agree awkward shapes aren’t fun to wrap - save yourself the misery! 3) The beauty of crackers is the person who pulls the bigger half wins the prize inside, so make sure you stand in the vicinity of the recipient and offer to help them pull…you could be bagging yourself that dram after all. A great gift for that person who always jokes about how it’s inappropriate to have gin for breakfast. Now they actually can, on their toast, swirled in their porridge or y’know, just straight from the jar with a spoon. It definitely works more effectively than pouring gin straight onto your food and will probably earn less bemused looks, too. There’s no denying some whiskies smell delicious, but if you went around emptying your drams across your furniture it would a) be messy and b) be an absolute waste of whisky, so it’s handy really that there’s a scented candle that smells of the stuff but won’t leave your carpets in a mess. Buy this for the whisky-loving interiors enthusiast and make all of their secret-santa-whisky-scented dreams come true. 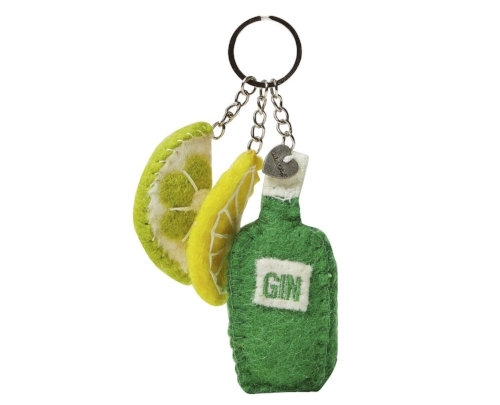 Accessorising with gin just got so much easier - buy this keyring for the stylish gin lover in your life/office. Keyrings might seem like the kind of thing you only buy at the end of a school trip, but trust us, whoever receives this will be very happy. The only way they might be happier is if it came attached to a bottle of actual gin.